In the early 1970s, in need of a critical response to the commercialization of film production and programming, Barbara Meter (Netherlands, b. 1939) co-founded the Electric Cinema. Run by members of the Amsterdamse Film Coop, and STOFF (the Studio for the Development of Film and Film Manifestations), the theater became the epicenter of Dutch independent and avant-garde filmmaking. At the Electric Cinema, Meter curated international avant-garde and expanded cinema programs. 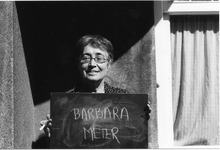 After that, she co- created POLKIN (Political Kinema) and made documentaries as part of activist and feminist movements. In her avant-garde films, she pushes the cinematic medium forward with her unique way of repurposing documents and audio recordings, utilizing an innovative, masterful application of optical printing techniques. Meter manipulates the images and reworks found sounds to find and create a personal expressive mode. Her essay ‘Looked for and Found: On Archival and Found Footage Film’ was written in 1995 for the London School of Printing, and continues to be of radical importance.